Trabant, another Chance creation, is a pretty cool ride. Appearance-wise I’ve seen these themed as roulette wheels, sombreros, and some type of strange 60’s UFO. Trabant is comprised of a circular disc with seats arranged around the edges. 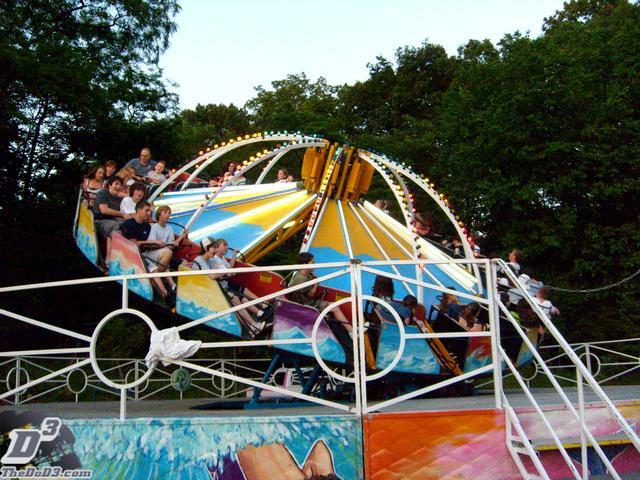 The disc is attached to a hydraulic lifting arm that is in turn attached to a rotating mechanism underneath the rides decking. The traditional late 60s light package for one of these rides includes red and off yellow turbo lights with off yellow florescent light tubes. Retro looking would be the nice way to put it. Riders are secured with a strange lapbar that is connected to the floor on one side and to the wall on the other. Some Trabants have another bar connected to the lapbar that snaps into a holder in front of the seat. I beleive this is simply a backup lock. Once the ride is started, the disc spins via a tire drive that skirts along the underside of the disc. On rainy days, or if the tire is needing to be replaced, the tire will squeal and let out a loud Velcro farting type noise as it rotates up to speed. Once up to speed the arm rises to an angle and finally the mechanism that holds the disc begins to rotate in the opposite direction making the disc do a wave type motion. Trabant is able to go forwards and backwards with some Trabant cycles starting forwards and switching to backwards halfway through and some starting backwards and ending forwards, it’s really up to the ride operator. Some people feel a stomach dropping sensation at the apex of the spin, but this ride is more known for the laterals which border on horrible. The seats are tilted downward a bit so the riders are already being pushed into the wall, add the spinning and it could leave a nice bruise if you have another person sitting with you. For the longest time, I had no idea what the hell a ‘trabant’ was; I mean, it’s not in the dictionary or anything. Apparently it’s just the word ‘satellite’ in German. In 1991 Chance made a successor to Trabant called Wipeout which features face to face seating compartments, hydraulic motors (forgoing the old tire drive) and additional flash. Mack also makes a Trabant type ride called Hully Gully which is, for all intents and purposes, a flashed out Trabant with backwall and excessive lighting. The Wave, a themed Trabant owned by Tommy’s Midway. It’s not too bad looking with some cool surf inspired paintings on the bottom flash. It also deviates from the norm and goes with a blue, orange and yellow paint scheme. This Trabant also spins faster than hell as you’ll see! Man, the reason I’m never getting on one of these things is that scene from the Sandlot where they ride one of these and end up puking their guts out. Horrible, horrible scene, that was. I’ve been on these alone before and I always loved the lateral forces. I purposely sat on the outside, despite the signs saying not to. Then I rode it with my friend a few weeks back; it wasn’t as fun. Having 150 pounds of weight jammed into you is not quite as fun spinning around at high speeds. One of my favorite flat rides! I never pass up a chance to ride a classic Trabant. 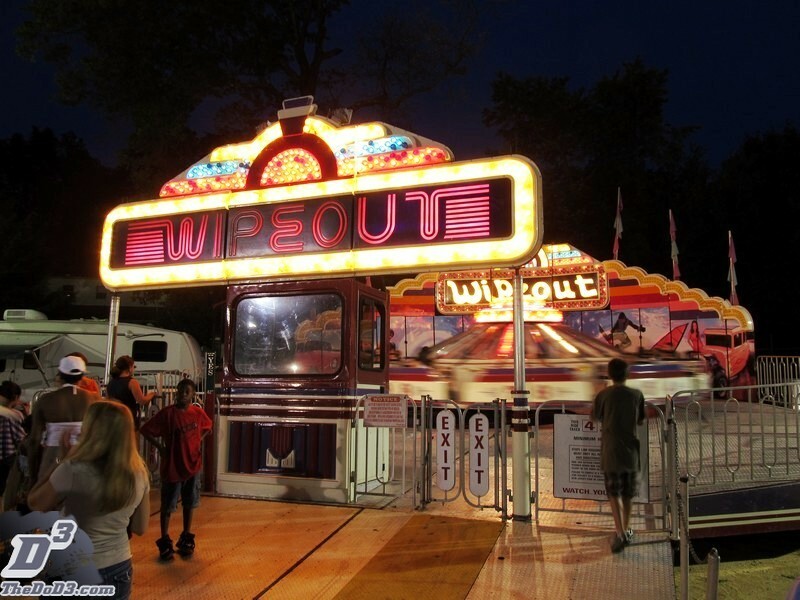 I’m not such a fan of the WipeOut as they tend to let it keep spinning full speed after it comes back down flat and the side forces become unbearable — equal or worse than a Music Express. There used to be a great version of one of these ay Miracle Strip amusement park in Panama City Beach, Florida. 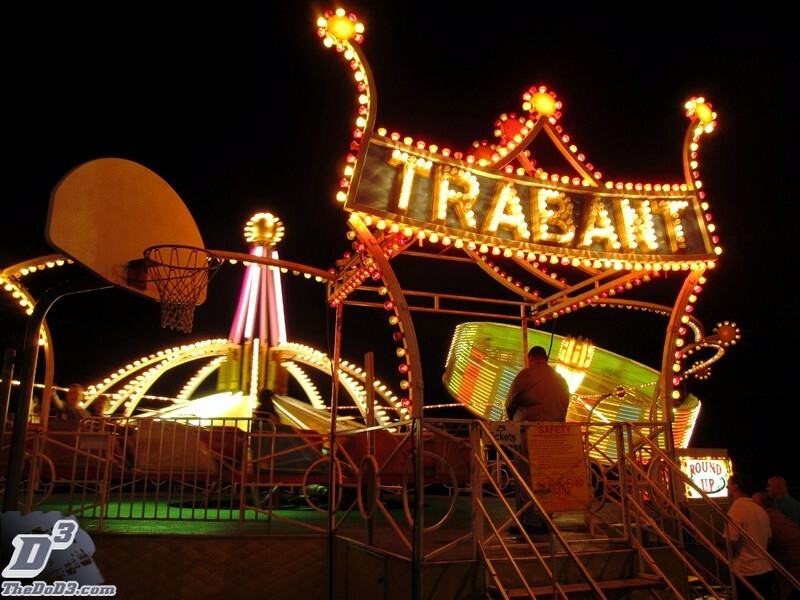 It was a standard Trabant, but it had been enclosed within an interior space and themed as “Dante’s Inferno.” When the ride started, they turned the lights off (so it was pitch black) until the ride built up speed, then when it started to lift up, a strobe light would go start. It was really amazing. 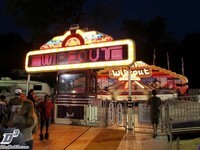 (The park did the same thing with two other rides: the tilt a whirl and the scrambler. The scrambler, in particular, was unforgettable because it was placed in a room full of mirrors). other rides of the show, with the exception being The Super Himalaya. Operated and moved a trabant up and down the east coast for years . Beautiful ride and best ride on the midway imo.